With Silver Travel enjoy seven nights for the price of five, and an exclusive $150 food and drink credit per room. 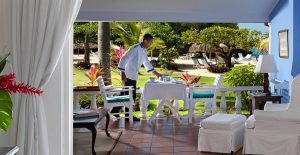 Since 1950, Jamaica Inn has ranked among top luxury hotels in the Caribbean. Nestled in Ocho Rios, on one of the premier private beaches in Jamaica, intimate suites and cottages showcase enchanting views of the Caribbean Sea. Here, it’s so romantic and relaxing, it whispers paradise. Prices based on two people sharing a Balcony Suite on a room only basis. Includes private transfers and flights with Virgin Atlantic. Terms and Conditions apply. Food and drink credit is only valid for stays from 1st Sep to 30th Oct 2017.